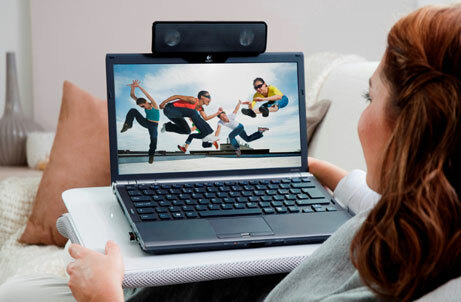 The Logitech Laptop Speaker Z205 is made for those who like to use their notebook and netbook computers to listen to music, watch movies or make video calls, and want a little better sound than can be had by their computer’s in-built speakers. “When designing the Logitech Laptop Speaker Z205, we wanted to help people get better audio while enjoying their favorite shows or music without sacrificing portability”, says Mark Schneider, vice president and general manager of Logitech’s audio business unit. The Z205 speakers are small, 6 cm tall, and 3 cm wide, and should clip on top of most notebook and netbook screens. They connect to the computer by USB, so there’s no need for batteries, and they are both Mac- and PC-friendly. The sound is driven by two drivers and a built-in amplifier. There’s an on/off switch on top, and the volume control. And in the box is a case to protect the Z20s when you throw them in your bag travelling. The Logitech Laptop Speaker Z205 will be available from the end of May. They will have an RRP of $69.95.